You’d be forgiven for thinking, based on its advertising, that HBO’s latest offering True Detective is just another big budget American crime drama – a veritable drop in the ocean. It isn’t. What it is, isn’t exactly easy to say – I’m not sure we’ll really know until its eight-episode season concludes, and perhaps not even then. 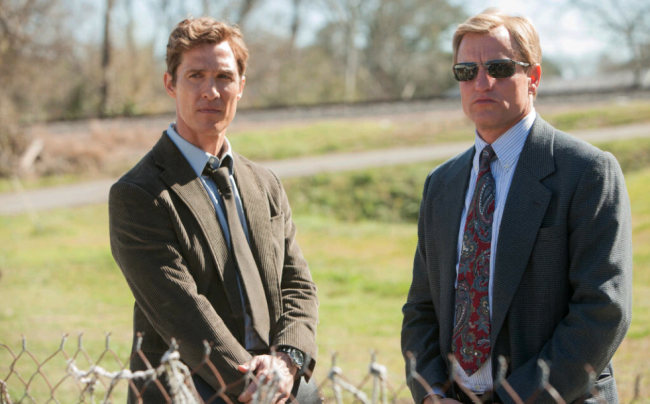 It has all the trappings of a murder mystery, sure, but the script seems only peripherally interested in the actual murder, and the real mysteries are its two central characters, played with career-defining zeal by Matthew McConaughey and Woody Harrelson. 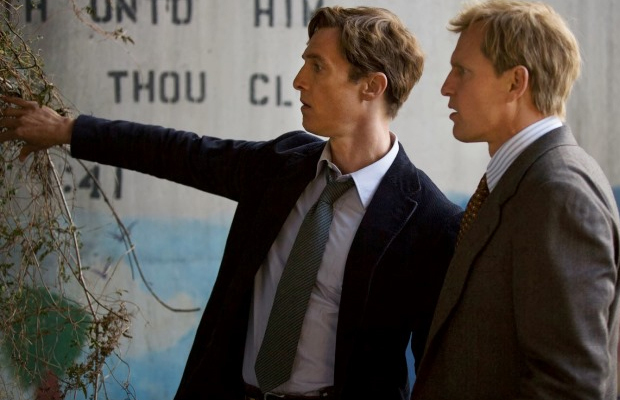 The format of the show is immediately intriguing – Rustin ‘Rust’ Cohle (McConaughey) and Martin ‘Marty’ Hart (Harrelson) are, individually, being interviewed about ‘the Dora Lang case’, a murder they investigated as partners in the early 90s. This forms the frame-tale, with the bulk of the action being flash-backs to that investigation, and to the beginnings of their relationship. In the past, we see them as the young detectives they were, driven and obsessive. In the present, we see them as the burn-outs they’ve become, estranged from each other and from the police force, and apparently forever scarred by the conclusion of the case. Ostensibly the interviews are to reconstruct records lost to weather damage, but quickly it becomes clear that the interviewers are, for reasons thus far unrevealed, more interested in Rust and Marty themselves than in the details of the investigation. 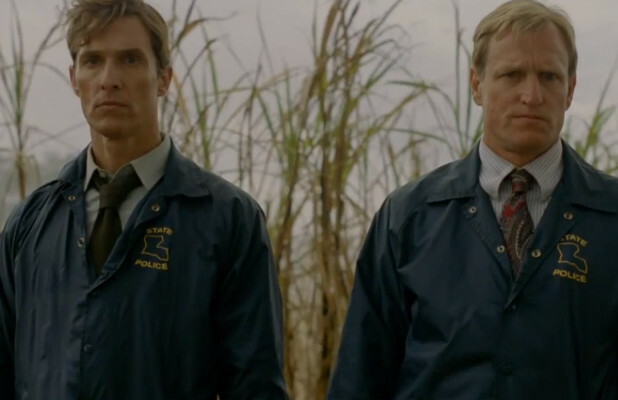 Already, just three episodes in, True Detective is as intense a character study as I’ve yet seen on the small screen. The bizarre, ritualistic murder of Dora Lang seems to exist more as a catalyst for reactions from the two men than as a story element in its own right. 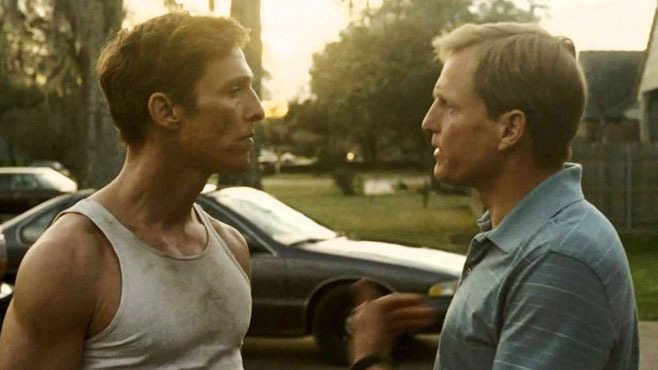 The vast majority of scenes consist simply of Cohle and Hart talking, often while driving to the next location, and in the way they discuss each new disovery, and play off each other the audience is given a fantastic insight into two wonderfully detailed personalities. 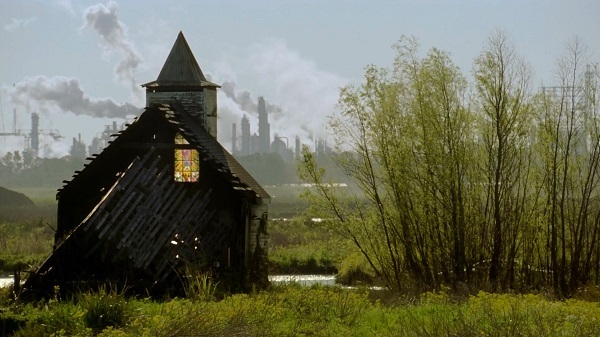 Hart is Southern salt-of-the-earth, a simple man with simple needs and old-fashioned values – but through Cohle’s dry remarks, we come to realise how much darkness, insecurity and hypocrisy lie beneath the surface. Cohle keeps all his darkness on the surface, giving chilling, impromptu speeches about futility, corruption and death in the overwrought style of a post-Noir anti-hero – but Hart is constantly ready to defuse him, to call him out on his pretentiousness and expose the cracks in his stony facade. The two characters perfectly reveal each other’s complexities, and it’s absolutely enthralling to watch. It is through their conversations too that the real themes of the show emerge. Cohle is the ultimate nihilist, wearily certain of the insignificance of mankind in a cold, unfeeling universe. Hart is a religious optimist, outwardly confident in his beliefs, morals and values – but at the same time, displaying an endless capacity for self-deception in his rationalising of his sinful private affairs. They’re both hypocrites. Cohle claims to see no value in existence at all, but by choosing to continue to exist, and by the passion of obsessions, he betrays a desperate need to find meaning in the world. Hart’s religion seems more reflexive than considered, and through his older self’s narration of events we see that he is totally unable to reconcile the truth of his actions with his supposed belief system. The writing is wonderfully insightful, using these flawed characters to fantastic effect as the mouthpieces for an age-old debate. The undeniable price of so many dialogue-heavy, character-driven scenes, however, is a slow story, one that moves only incrementally forward each episode, even as revelations about the characters come thick and fast. There is definitely room for it go to some interesting places, especially with the overt Lovecraftian inspirations in its seemingly occult murder, but so far, three episodes in, it’s shown no sign of it being in any hurry to get anywhere soon. The supporting cast too is neglected – barely given time to develop and clearly unable to hold their own in their performances alongside Harrelson and McConaughey. They very much feel like bit players to be moved around in service of Hart and Cohle’s story, rather than anything interesting unto themselves. Hart’s wife (Michelle Monaghan) and mistress (Alexandra Daddario) especially feel more like pretty set-dressing than people, with vague motivations and simplistic arcs. It is testament then to the performances of McConaughey and Harrelson that the show succeeds so strongly in spite of these flaws. Their performances are beyond exceptional. McConaughey especially seems to have transformed himself as an actor – the lean, nihilistic Cohle couldn’t be further from the hunky rom-com charmers he’s played in the past, and the intensity of his acting is an absolute revelation. It’s easily the best performance of his career so far. I sincerely hope True Detective doesn’t just get lost among the crowd of big-budget American shows. They certainly haven’t made it easy for themselves – I suspect the generic advertising and name will leave it relying almost entirely on word-of-mouth. Trust me, then, when I say that this isn’t just another detective drama – this is truly unique, fascinating television.